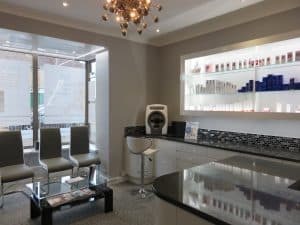 Have you seen—Finishing Touch Clinic has had a face lift, and we’ve introduced a new face lifting treatment for you too! But that’s not the only face lift we’ve introduced around here…I’ve been dying to tell you about the HIFU Facelift, the once-a-year face lifting treatment we’ve got for you! (HIFU stands for High Intensity Focused Ultrasound. It’s a non-invasive facelift which lasts a full Year). Yes, you heard that right. Only one treatment required per year. We introduced this incredible facelift only a few weeks ago and the results have been truly AMAZING! The whole process takes about 3 hours and the transformation is instant…but the lifting result actually gets better over the next 100 days! Some of the team here at Finishing Touch Clinic have had the HIFU facelift treatment (guess who’s had the treatment the next time you’re in!) along with several other lucky clients who have benefited from our introductory offer of a HUGE 50% discount! You can opt for this super-lifting treatment on your full face (this includes jowls and neck), or half face. 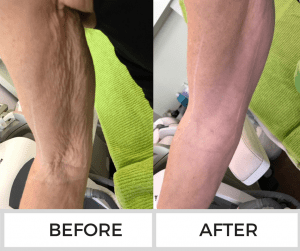 HIFU works amazingly well on loose arm skin too, I am sure you agree that the photos are REMARKABLE! HIFU works amazingly well on loose skin anywhere on the body as you can see by this before/after image from only one treatment. HIFU works on 3 levels of skin depth so that your skin is tightened from the inside out. The effect are similar to up to 16000 tiny shrink wraps in the skin. These tiny wounds then cause the skin to tighten and to produce collagen, making the skin younger in appearance. In effect, we are working in the SMAS skin layer at the same depth as a surgeon goes to when he wants to tighten underlying skin during a facelift procedure. Only HIFU is totally non-invasive. How much does HIFU cost? The full HIFU face lift (including neck and jowls) is £1000. When you see the results our clients are getting, you’ll have to agree this is a tiny price for a full year of lifted, toned skin from the base of your neck up to your forehead. We’ve been so busy with both the renovation of Finishing Touch AND performing HIFU face lifting treatments that we haven’t had chance to let you know about the treatment before this. So in the interests of fair play, I am going to extend the 50% discount offer until Friday 5th May. To claim your 50% discount you MUST book and pay before Friday 5th May. Currently most of our May appointments are gone, so get your booking in by Friday 5th May to avail of our very special 50% discount, and to claim your spot. After Friday 5th May we will be charging the full price of £1000, so make sure you don’t miss out on this once-in-a-lifetime offer, it will NEVER be repeated! Pick up the ‘phone and call us on 01207 580880, or pop into the salon today to make sure you get your 50% off your HIFU facelift – we have limited appointment slots left in May and we’re expecting these to sell out quickly!